XYZ company was not able to find out the reason for many color shade, from garment to garment of denim kids top, although the fabric were from the same supplier, method of production were same and wet processing recipe and cycle time were same for entire garment. After consultation with professionals, company came to know the major lacking in method called ‘blanket test’. 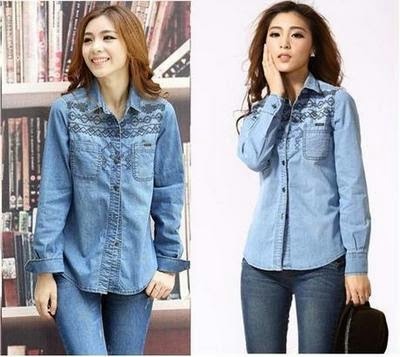 Denim is basically twill weaves fabric and strength of fabric (ounce) is determined through yarn count and kind of yarn used in constructing the fabric. Grey twill fabric is coated through dark pigment color (dyes) and through wet processing desired faded color shade of final product occurs. Denim wet processing is very technical process and for desired effect on garment - chemical recipe, method, cycle time and kind of machinery required is decided and arranged before mass process start. 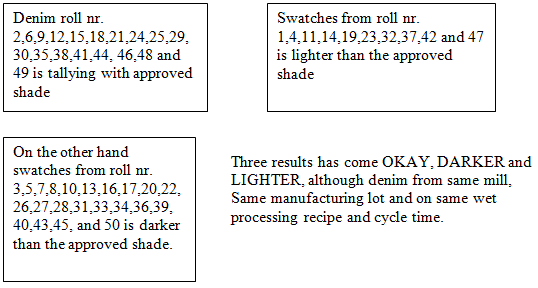 If, on common recipe all the garments, which are made from different denim rolls, are processed, there are plenty of chances, different color shades may occur from different dyed layer of denim rolls. For controlling this, method is developed, known as ‘Blanket test of denim’. Following is the complete know–how of color lot management in denim wet processing through blanket. Buyer has given an approved shade of color and after wet processing the garment should be of same shade. For achieving the recommended shade a chemical recipe and cycle time has been developed. 25 x 25 cm swatches, taken from all 50 denim rolls, stitched together, as diagram shown above is known as ‘blanket’. Hereinafter blanket means the same blanket, which is being discussed. For example out of 50 rolls of denim 4 blankets has been made. Roll 1-to 12 is in blanket number 01, roll number13 to 25 is in blanket number 02, roll number 26 to 38 is in blanket number 03 and roll number 37 to 50 is in blanket number 04. Means blanket number one is representing 12 denim rolls, similarly blanket number two is representing 13 rolls, blanket number three 13 rolls and blanket number four 14 rolls. Now all four blanket would be wet processed in defined recipe and cycle time for achieving the buyer approved faded shade look of denim. After wet process the following result has come. Obviously for the lighter and darker shade, different recipe and cycle time would be developed for wet processing. Factory may get denim in part or phases in the middle of production but the process would be the same. Make the blanket and do the wet process to identify the correct family of denim rolls. Now the big question arises that how factory would control the mass production of garment in cutting, sewing and wet processing according to color shade of different denim rolls. Simple method is to mark the every fabric roll in number. While layer in cutting, after completion of one roll put news paper or waste cut parts of other color fabric before putting the second roll. Similarly, in numbering and bundling put fabric roll identification along with other information on bundle tag. After sewing of the garment, write the fabric roll number on every garment through white pencil. For example, out of denim roll number 04 total 72 garments were cut and stitched, then entire 72 garments would have roll number 04 marked through white pencil. In wet process these 72 garments would be processed as per lighter shade cycle time and recipe. Because roll number four belongs in lighter category. This identification number is required till beginning of wet processing for segregation and finding out the right family of each garment for color shade. Alterations are recommended after wet processing because in wet process wherever bacteria gets the bigger needle mark, starts eating the fabrics, in result needle holes are become the bigger hole and garment gets rejected i.e. enzyme bacteria. Indeed, intensive research has been done in modern fashion world for unlimited verity of denim finishes and processing method. Verities of denim fabrics are available, for example pre-soft denim and depth of indigo dye on fabric is less for achieving the approved faded shade in quicker time, with less water, less energy consumption and in less consumption of chemical expenses. Nevertheless variation in final product would occur in any kind of process if blanket process were not executed in proper way to avoid roll-to-roll variation.